In August, Deborah Turness will become the first woman to head a network news division as she takes the reins as president of NBC News. Nine years ago, she made history in precisely the same way in Great Britain, as she headed ITV News, a BBC rival. 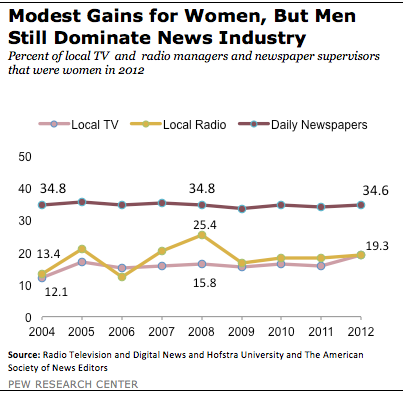 But industry data show that men continue to occupy most of the top positions in local TV and radio, as well as at daily newspapers in the U.S.
Forty percent of people who worked at local television stations in 2012 were women, but less than 20% of the general managers were, according to a newsroom survey conducted by the Radio Television and Digital News Association, in conjunction with Hofstra University. Still, this represents a rise –up from 15.8% in 2011. In 2004, women filled just 12.1% of television management positions. In radio, women make up the same percentage of managers (19.3%), the RTDNA 2012 survey reported. But the trajectory over time has been bumpier. The proportion of women in radio management has been relatively stable the last three years, but represents a decline from 2008, when one-quarter of the general managers were women. 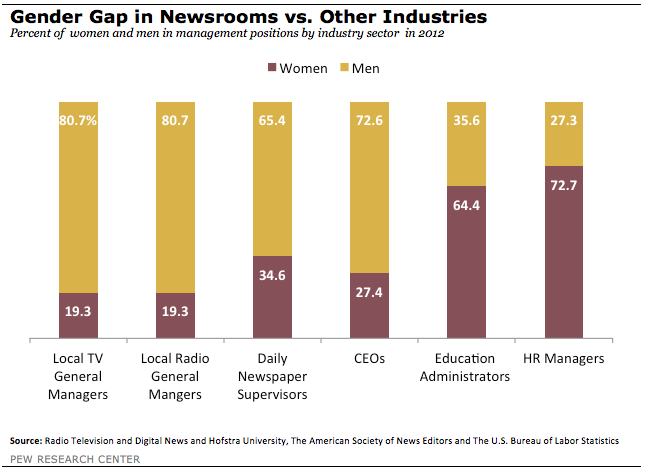 The percentage of female managers at daily newspapers has remained stagnant for years. In 1998, 33.8% of newspaper supervisors were women; in 2012, 34.6% were, according to the American Society of News Editors, which conducts an annual newsroom census. The ASNE, which released its latest census last week, does not document the percentage of newspaper executive editors who are women, but a look at the 10 largest newspapers (based on weekday print and digital circulation) suggests the numbers would not be large. Among these newspapers, only The New York Times has a female executive editor: Jill Abramson, who in 2011 became the first woman to head The Times since its founding in 1851. Outside the news industry, the proportion of women in managerial roles varies greatly. The U.S. Bureau of Labor Statistics (pdf) found that, in 2012, women made up the majority of human resource managers (72.7%), social service managers (70.5%), public relations and fundraising managers (69.3%) and education administrators (64.4%). But they comprise only 10.9% of architectural and engineering managers and 6.4% of construction managers. Conversely, only about one-quarter (27.4%) of CEOs were women in 2012, up from 24.2% in 2011, the bureau reported. And merely 20 (4%) Fortune 500 companies have women CEOs. At NBC, Turness will face a number of challenges. The network’s longtime ratings giants, The Today Show and Meet the Press, both were overtaken by ABC rivals last year. And although NBC Nightly News still leads its evening competitors, the margin has narrowed.